Unless otherwise stated, provided by the project staff. The technical support of the WWW server www.validproject.at is provided by FH JOANNEUM Gesellschaft mbH. If you have technical problems, please send your e-mail to the webmaster. All texts on the VALiD website have been carefully checked. Nevertheless, no guarantee can be given for the accuracy, completeness and actuality of the information. A liability of the University of Applied Sciences St. Pölten is therefore excluded. The links to other websites have been carefully selected. Since the University of Applied Sciences St. Pölten has no influence on their content, the University of Applied Sciences St. Pölten takes no responsibility for this. Unless otherwise stated, this work or its contents are licensed under a Creative Commons Attribution 3.0 Austria license (CC BY 3.0 AT). for any purpose, even commercial. The licensor can not revoke these freedoms as long as you comply with the license terms. Attribution – You must provide adequate copyright and legal information, attach a link to the license and indicate if any changes have been made. This information may be given in any reasonable manner, but not in a way that gives the impression that the licensor particularly supports you or your use. Data are processed electronically in connection with newsletter subscriptions. Such processing is based on your consent in accordance with data protection law. 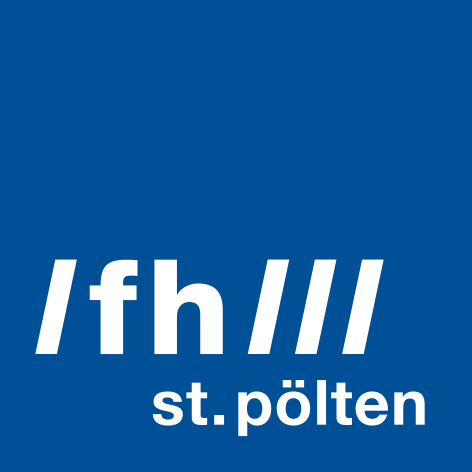 Fachhochschule St. Pölten GmbH electronically processes all of the personal data you provide when subscribing. Subscription is only possible by entering the required information (obligatory fields are marked ‘*’) in the online form provided. Your subscription request cannot be accepted if you do not provide the required data. St. Pölten University of Applied Sciences stores the information that you provide, in particular your e-mail address. Data are deleted at the latest three years after the last date on which you contacted us, unless you consent to a longer retention period. The declaration of consent provided by means of the online application may be withdrawn at any time. Such withdrawal does not affect the lawfulness of processing carried out on the basis of your consent prior to withdrawal. If you withdraw your consent, all data that enable you to be identified will be deleted. As a result, further processing of your subscription request will not be possible. You can withdraw your consent by writing to datenschutz@fhstp.ac.at. Data generated as a result of processing in connection with newsletter delivery are transferred to a processor within the EU, for the purpose of handling delivery of newsletters. Data are transferred on the basis of a processing agreement with eyepin GmbH. All data are stored on servers that are operated to high security standards and are protected against unauthorised access and abuse. You can exercise these rights by contacting Fachhochschule St. Pölten GmbH as the data controller (datenschutz@fhstp.ac.at). You also have the right to lodge a complaint with the competent supervisory authority, namely the Austrian Data Protection Authority, Wickenburggasse 8, 1080 Vienna, tel. +43 (0)1 521520, e-mail: dsb@dsb.gv.at. If you have any other questions or suggestions, you can contact us by e-mail: datenschutz@fhstp.ac.at, at any time.